As elation and field-rushing cascaded over Folsom Field, a smiling Mike MacIntyre said it all about his mission as the Colorado head coach in an on-field interview. Well, after dispensing of Washington State behind a 24-7 second half, they’re one win (or one Southern Cal loss) away from representing the Pac-12 South in the conference’s championship game. Buffs 38, Cougars 24. 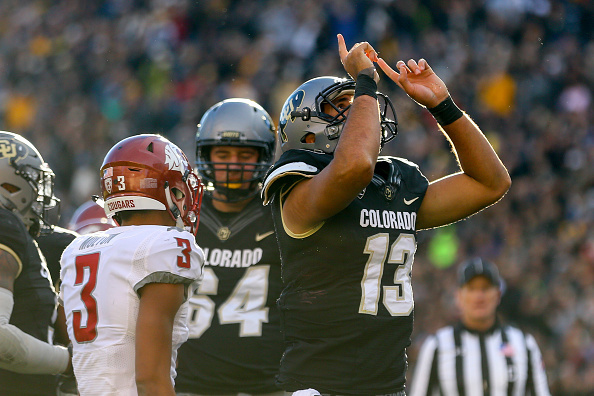 Quarterback Sefo Liufau threw for 345 yards and ran for three scores in a 453 total-yard day against a WSU team that in its own right was seeking firm footing for a division crown. Had they won and rival Washington lost, they’d have clinched the division. As it stands, CU’s Renaissance season only continues, and they’re up to a 9-2 mark. If you’re surprised, though, you probably haven’t been paying attention to MacIntyre’s career. Not to get too far into the historical weeds, but this is a guy that took over a San Jose State program that was among the most moribund in college football, plus was on a scholarship restriction from flailing APR rates. It took some doing (three years, to be exact), but the Spartans went from 1-12 to 10-2. It’s taken four years with Colorado, but this is a program that’s won six or more games just once since 2007, a staggering number for one of the great programs through the 1990s and early 2000s. And it’s come under the electric play of Liufau, a guy who’s getting his payout after a career of injuries, tough luck, and losses. And boy, it must feel good. Colorado dispensed of white-hot Wazzu, winners of eight straight after season-opening losses to FCS Eastern Washington and Boise State, by mostly harassing Luke Falk into bizarrely bad throws and turnovers. Falk averaged only 6.1 yards per pass on his 53 of them and was strip-sacked on the play that ostensibly ended the game. At halftime, it was a close affair, Wazzu up 17-14 after CU’s continually awful field goal kicking reared its ugly head. That came shortly after a dropped touchdown pass and a blatant missed pass interference call. But, as good teams do, the Buffs collected their undercarriage and came into the second half guns blazing, and WSU simply couldn’t keep up. Your odd stat of the game is that Liufau completed only one more pass on 12 fewer attempts but had 20 more passing yards than Falk. Then you have Phillip Lindsay, who rolled for two scores and 144 yards. The Buffs committed to the run game while WSU, who honestly saw the ground game as the catalyst for their turnaround, abandoned it. Wazzu ran an inexplicably low 22 times, even though those 22 times went for an average of 6.2 yards per carry, and that’s counting the 4 rushes for -4 yards by Falk. One can assume when they watch the film, there will be wailing and gnashing of teeth about the lack of commitment to the run. WSU shot themselves in the play-calling foot, going back to the same things that plagued them when they couldn’t find wins early in the season. 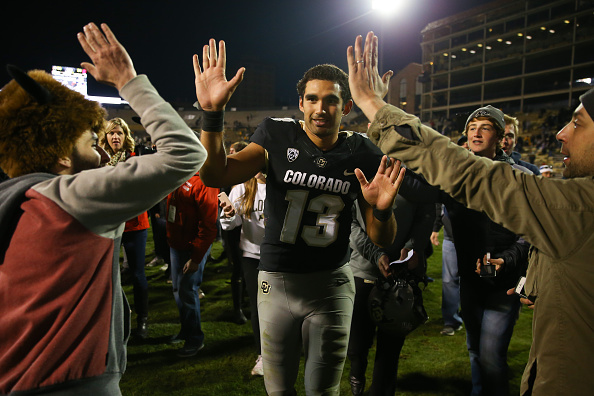 At any rate, Colorado is one of-if not the-feel-good stories of 2016 college football. Think: Colorado, win or lose, will have an impact on the CFB Playoff … maybe even (in some twisted hurricane of chaos) as a participant. Coach MacIntyre…CU might be great again already.